I’ve said it before and I’ll say it again, the best way to find new places in London is to explore. The other day I did exactly that. I was due to be meeting a friend at 6.15 (although it ended up being much later than that) and decided I would kill some time by walking from Euston to Oxford Circus rather than take the train. Given that it was a fairly nice day I had problem walking slowly and taking in everything that was around me. For those who know me, I am often referred to as a bit of a London know-it-all. I’m extremely proficient with London roads and have no problem offering my opinion with regard to the quickest route or where to eat. However there are certain area’s in London that I only ever drive through, so walking around is a bit of a novelty. Where am I going with all this, you may ask. Well whilst walking to Oxford Circus I noticed a few funky places that I thought I must try. At this point, I am yet to give them a go, but I thought I would share my find’s for those of you that might be looking for somewhere new to visit. Alternatively for those who have already been to any of these places, please do leave a comment with your thoughts. I have decided to make this a bit of a regular feature, so whenever I do see anywhere new and funky that I may not have visited yet, I will be sure to let you all know! I’ve walked past this one a few times before and it always seems fairly busy. I haven’t yet been able to go in, but doing a quick search online tells me that it originated in Egypt and offers free wifi. The menu seems fairly vast and offers numerous types of coffee’s, shakes and juices whilst food wise there’s salads, sandwiches, pasta and more. This was another little place that caught my eye whilst walking past. I looked in to see a very casual looking, wooden tabled coffee shop. When I looked above the door for the sign, I saw a bicycle with the word ‘Coffee’ written within it. The only other thing I had to go on was the No.114 written along the frontage of the shop. It took a bit of research to figure out the name of this place and when I finally stumbled across it, I let out a sigh of relief. Again not a place I’ve had the pleasure of trying (yet) but it seems for those looking for an independently owned coffee shop serving a number of different blends of teas, a selection of coffee’s brewed in a choice of three ways and some rather yummy looking food this might be a good place to try. As I got closer to Oxford Circus, I remembered that Great Portland Street has some super cool wholesale shops that are open to the public at certain times of the day and days of the week. 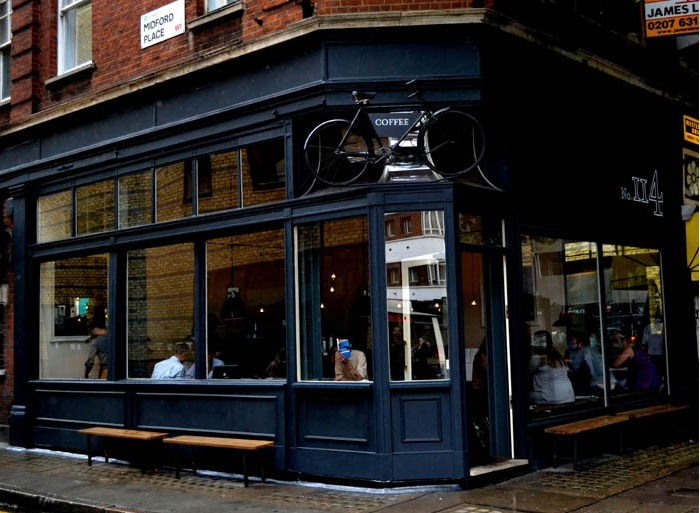 So whilst weaving in and out of random lanes, I spotted this trendy coffee-house from a mile off and actually walked up to it just to have a sneak peek at what it was I had spotted. This Australian/New Zealand owned cafe is quite obviously passionate about coffee. 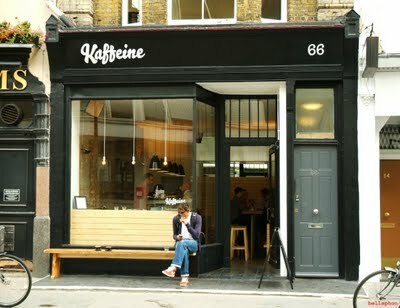 The website describes their search for a place that has “brilliant coffee and light, fresh food in a space that has a chilled atmosphere, a groovy, funky music policy and service standards that are based on genuine hospitality” and from the reviews it seems they may have achieved just that. I was also extremely excited to see that they offer ‘Coffee Courses’ to teach the amateur coffee lover how to brew coffee like an expert! Another one that is on my list of places to try! As I said at the start, these are three places I found whilst exploring London, I am yet to visit and give them a go, so keep an eye out for my updated and as usual, very honest opinions. In the meantime, if you have tried any of these, do drop me a line and let me know what you thought! Also for those coffee lovers out these, I came across a handy little article published by The Independent noting their 50 best Coffee Shops. Have a read.